Most people that visit Curaçao expect to lay on our white sandy beaches enjoying every beam of sunlight. But, Curaçao has a lot more to offer to the curious souls willing to explore the island on a deeper level. Curaçao is filled with beautiful sights that tell the story of the island and how the culture is formed. Willemstad, the heart of the island, is one of the first places to explore. 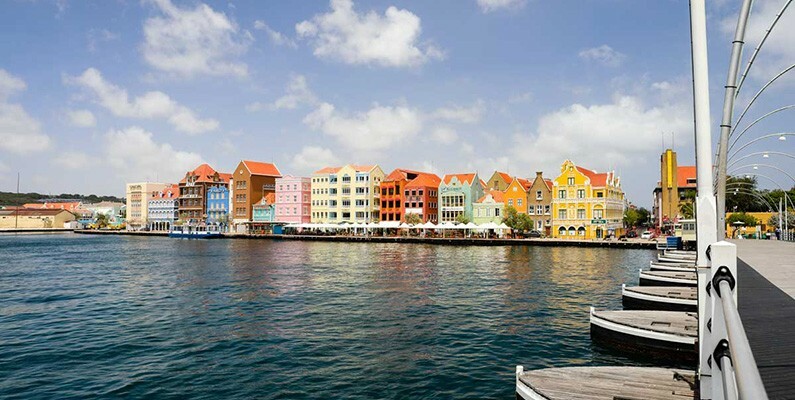 Willemstad, the capital of Curaçao, is the historic center and the most photographed place on the island. Not to mention that the historic area is also a UNESCO World Heritage site. It’s the perfect place to start your tour around the island. You can easily visit all the sights in a day as most are within walking distance of each other. Start your day early with a view of the Handelskade and the iconic Our Swinging Old Lady, Queen Emma Bridge. This bridge, built in 1888, connects the Willemstad’s quarters Punda and Otrobanda with each other. The Handelskade portrays the Dutch influences on the island in a colorful way. These colorful buildings used to be the center of trade in the past. Otrobanda gives you the best view of these two landmarks. After admiring the Queen Emma Bridge and the Handelskade, pay a visit to the Curaçao Museum Kura Hulanda that is just nearby. This museum will give you a good look into the history of slavery, but also goes deeper, bringing you all the way back to Africa. Slavery is a period in the history of Curaçao that shaped the whole future of the island. The museum opens at 09:30 and you can do a (self) guided tour or take an audio guide. If you are by car then take your car and drive towards Punda. You can park your car around the area of Wilhelminaplein or in the parking garage nearby. Then go first to the Synagogue and afterward to the floating market. After doing a tour at Curaçao Museum Kura Hulanda head back to the Queen Emma Bridge and cross the bridge. Walk past the Handelskade towards the Floating Market. The Floating Market is a market where Venezuelan merchants come by boat to sell their produce. They stay for a small period of time and then return to Venezuela. In front of their wooden boats, they have stalls with either fish, fruits or vegetables. Sometimes, they even sell cookies, chocolates or other sweets from Venezuela. Buy a Cocosete as a snack to go. It’s a delicious cookie made of coconut. Head to the Mikvé Isreal-Emanuel Synagogue for a tour in the oldest surviving synagogue in the Americas. The Jewish community has a deep influence on the culture of Curaçao. You can learn more about this and Jewish religion during your visit to the synagogue. The inside of the synagogue is beautiful with a unique sand floor. If you are into local cuisine then take a seat at one of the long tables at Plasa Bieu around noon. There are various stalls that offer typical local dishes. Try a fried fish with polenta and a pumpkin pancake as dessert. Pair your meal with a refreshing awa di lamunchi (limeade). Pietermaai is an up-and-coming neighborhood with lots of (street) art, authentic music and beautiful Dutch colonial architecture. The neighborhood was a former residential neighborhood for wealthy merchants. You can still admire the picturesque homes that nowadays have become unique shops, boutique hotels and top-rated restaurants. There are still some houses unrestored, but precisely this is what gives this neighborhood a rough edge and funky vibe. During the night, this area turns into a cozy yet upbeat place to spend a fun evening. If you are by car then go back to your car and drive towards Saliña. If you are using public transportation then you have to go back to the PT-terminal in Punda. Drive outside the historic center towards Saliña or take the big bus (Bonam, Punda Hato Souax or Schottegat) and stop at Landhuis Chobolobo. Don’t forget to snap a picture of the colorful residential houses on your left when going uphill. Landhuis Chobolobo is a 19th-century mansion and home of the Genuine Curaçao Liqueur. Visit the Curaçao Liqueur Distillery to learn how this world-famous liqueur is made. Various guided tours are offered.